Tungsten carbide rings are 10 times harder than 18k gold, 5 times harder than steel,4 times harder than titanium. The perfect ring to reflect the tough people who make up our Emergency Services, law Enforcement and the Protection Services occupations. 911 Rings are made from one of the hardest metals on earth. They are virtually scratch resistant and will withstand the test of time. virtually scratch-resistant will not show the wear that other rings show overtime. We have an optional limlted lifetime warranty you can purchase with the ring. After the arrest, after the media coverage before and after the trial there is jail. The Police and the Lawyers receive the media coverage but everyday the thousands of men and woman across this country ensure the countrys jail run. They protect the public while making sure the inmates are safe from each other, clothed and fed, receive healthcare, and all kinds of programs to help them. These men and women live in a world that people outside of Corrections cannot not even image, nevermind even begin to understand. They risk their health, safety and lives everyday they set foot in the world they work in. Assaults, physical and verbal abuse, Aids, Hepatitus B and C and pyschological trauma are all the daily risks. Imagine being licked in a room with 20, 40, 60, 80 people who would like nothing more than to assault you. The constant hypervigilance and years of trauma and abuse take its toll. Everyday they go to work and keep the people who the public locks their door at night to keep out and cross the street to avoid safely behind bars. All the qualities that make them a good Correctional Officer make them a bad human being. After every shift, they change their clothes and try and leave all of the crap the see and put up with at work. They jump in their car and make that drive from work back to normal. A difficult task but one they try do everyday. Recognition for the job they do doesnt happen. When they make a mistake people notice. When they do something good no one notices it. 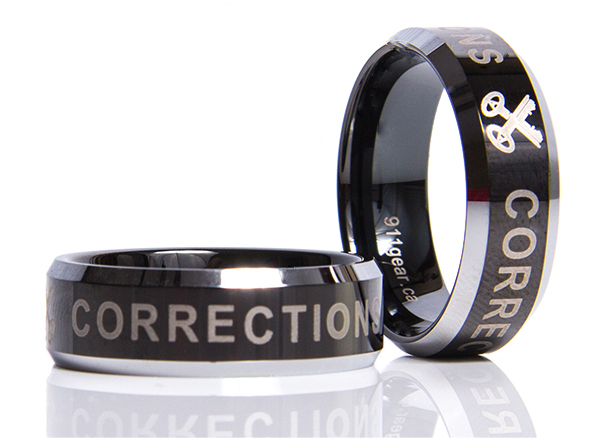 The Corrections ring is a perfect way to recognize the service these Officers perform for the public 24 hours a day 7 days a week. Sizing Instructions: There are many ways to size a ring on the internet. A quick Google search will bring you many different pages on how you should size your finger to figure out your ring size. PLEASE DO NOT measure any of these ways. The best way to size your finger is to get it done professionally. Go to a Jewellery store and have them size your finger.